I did not want to muddy the above thread on Perry vs. Cardinal. Every poll I found has shooters preferring turning paper targets to electronic by about 70% vs. 30% Why is CMP so hellbent on going to electronic targets? Clearly shooters are not asking for it. It's massively expensive vs paper. It would force almost everyone to shoot matches and practice on turning paper and then show up at the Nationals and shoot on a different system. Why? For those that like them. Have you had a positive trouble free experience with an existing system that you feel CMP could make workable on a large scale? Or do you just not want to score? Other reasons? I still believe in that statement, cause I as a shooter would have no choice other than not to go and shoot. When all this E-target thing came out I thought it would be all the same as paper but I am starting to change my mind. Do the black holes change in size from the 50 to 25 yd line ? Is there feedback of your last shot so in case you have to make a stance or sight adjustment ? I think precision shooting even advancing into electronics needs to mirror what we have now with paper turning targets. I've had nothing but good experiences with eTargets. I also have a SIUS for AP at home. Using an app that gives the range commands, I practice both slow and sustained fire with my LP50 which has a 1911 grip and a 4lb trigger. The sensors are microphones. I do not know how much they cost, but probably not as much as one would think. The targets on many/most are rubber, self healing type membranes easily replaced, and meant to be. They take lots of hits....lots. On the smallbore targets and the international pistol targets, the sensors are housed in or behind a protective box/steel. Instead of breaking a leg on the frame, everyone will get to laugh when you "ring" the box. It might not be what you are interested in, but having seen the spectator side of things at collegiate rifle matches, it would mean that we as competitors are not treated as a money losing proposition by the NRA. I personally will shoot whether the targets are paper or electronic, and as I believe Clarence stated in another post, no matter where the match is held. I shoot to shoot, and for my personal pleasure. The how, when, and where is not material, but being able to sell it to others is likely to be a very positive change to all of the "paper punching" sports like ours are. Thanks for posting the link. We had an air gun match yesterday with around 15 competitors and 4 spectators. Everything was quiet. What a difference with the Norwegian match!! It was interesting to see the self-sealing electronic targets and surprising that the bolt-actions dominated the semi-autos. Just watched the video, rather enjoyed it. That is some great bolt action manipulation plus accuracy. Never thought of using the middle finger for the trigger, but makes sense with what they are doing. Most US shooters that tried it went back to shooting with the index finger. Watching an old time match rifle shooter manipulate a bolt in rapid fire is a study in motion. 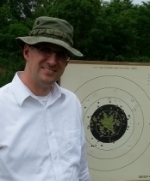 The only "e-targets" I have shot on was the CMP air gun range at Camp Perry. What a pleasure to shoot on! Try them out in 2016 it may change your mind. electronic targets are great, in air pistol and in 22, if they could be as good and durable as well as accurate in the large calibers of pistol and rifle I think people would shoot on them and eventually prefer them. That equipment from what ive read doesn't exist right now or its not what is in use. The pistol and high power targets are different. The pistol is 2 feet square and the rifle is 6 feet square. My concern with the KTM pistol targets is what conventional targets look like after a 2700. What we generally see at that point is a 9 ring sized hole in the center of the backer. This makes me think that the maintenance will be extremely important, and it's not maintenance that summer workers can easily do (unlike pasting targets on backers). I am looking forward to trying the targets at the Talledega pistol range. But it will not be this year. I'll be firing rifle and pistol in Talladega next week, so I'l mention how it goes after the fact. Two folks that I know reported no issues at the Inagural matches they had a few months ago there. There were significant issues reported at the inaugural pistol matches when it was learned that the system was computing all CF competitors were programmed in the computer as having the same caliber rounds which would have an effect on accurately scoring shots that were close to the line. If I remember correctly, No pistol shooters at the inaugural matches shot above the minimum cut score...it's unknown if the difference would have changed the outcome. If anything their score would have been higher than they actually shot not lower. All CF targets were scored as if they were shooting a 45 since they only used the 45 scoring mask. So anyone shooting a 9mm may have gotten a few extra points on close shots. The system determines the center of the shot and then calculates the score based on adding the caliber mask to the center point. Rob Kovach wrote: There were significant issues reported at the inaugural pistol matches when it was learned that the system was computing all CF competitors were programmed in the computer as having the same caliber rounds which would have an effect on accurately scoring shots that were close to the line. Rob, for pistol IIRC there was only one shooter who barely hit 250 and he earned a hard leg because of it. I have't taken the time to check, but that's what I heard. Edit: I took the time to check, and yes Zachary Hagen shot a 255 (only non-distinguished to shoot above the minimum cut) and earned a 10 point leg out of it. Next closest was a trio of 248s. The Talladega 600 is next week already. Below you will find the link to the rules for firing and competing on electronic targets. These rules will be used for the 2015 Talladega 600. You will also receive a copy of these rules in your competitor packets when you check in at the clubhouse. Safe travels to the event and good luck. Thanks for posting that link RG. They know there are going to be issues ? There will be issues ? Looks like they are prepared for these issues ? Those whom attend, please post feedback. I honestly hope it all goes well. Hmmm. The way I read the new regs, if you have a shot counted as a miss then no problem as long as all your other rounds were in the black at 200 yds. That would be tough with a pistol. Were there new regs for pistol that I missed? I sure hope that all your rounds at 50 yds don't have to be in the black before you can argue about a miss. Len. That's the same with targets scored in pits. You have to challenge when the shot is scored and before the next shot. When you shoot on the target you accept the score as indicated. That works good for rifle. I don't see it working for pistol. I often shoot doubles and if I am really in the groove triples when shooting SF. It would force everyone to shoot one shot at a time and then look at the monitor. I don't need to look thru a scope to know if/where my bullet went when the trigger goes off. There is a duty when shooting rifle that the scorer or monitor has to announce the score so the shooter can hear it. Since there is a monitor here to determine if there is a hit or a miss and the correct number of shots are fired, then that person can also announce the score. So if you break a good shot and expect a 10 but hear an 8 being announced then you can look at the monitor. I did not realize that the monitor made any noise or announced the score. That would help. Not that I would be able to hear it. My wife thinks I am going deaf but since I can't hear her she is easy to ignore. OldMaster65 wrote: I did not realize that the monitor made any noise or announced the score. That would help. Not that I would be able to hear it. My wife thinks I am going deaf but since I can't hear her she is easy to ignore. I don't know just how this would be applied to pistol, the rules as I read them seem to fit (as well as possible) highpower rifle. Perhaps things have changed in the intervening years since I was a competitor but in slow fire the targets are scored in the pits and recorded by the scorekeeper who would be the shooter before or after the 'current' one. Said scorer takes a position adjacent to the shooter and announces the number and value of each shot as it is scored and posted by the pit crew, that would make it fairly easy to note a shot (crossfire?) being scored when the shooter had not fired. If the shooter fires and the target is not pulled into the pits, the scorer calls for the target to be 'marked'. Should no hit be found it is scored as a miss (been there, done that, cost me my master card but there was a pretty 10 on the next target over!). In rapid fire the scorer observes the shooter to verify that the correct number of shots were fired and that they were within the 'legal' time allotment. If the target is visible, it can be shot, noting early or late shots just helps identify where 'the misses' went! If there are 10 hits the shots are marked and a scoreboard is hung on the target when it is run up listing the number and value of the hits. Insufficient or excessive hits have their own rules to settle the score, this can be where the scorer counting comes into play. My pistol shooting has thus far been limited to our league where there are usually no 'extra' bodies available to count shots and we just score the adjacent target when we go forward so I don't know what would need to be changed to adapt to e-targets. Siri: "That was an 8, at 2 o'clock, Rob. Way to pull the trigger with all 4 fingers." "That was a 7 at 7 o'clock. It looks like you jerked the trigger, bozo." Rob: "Match director, somebody just shot my monitor!"